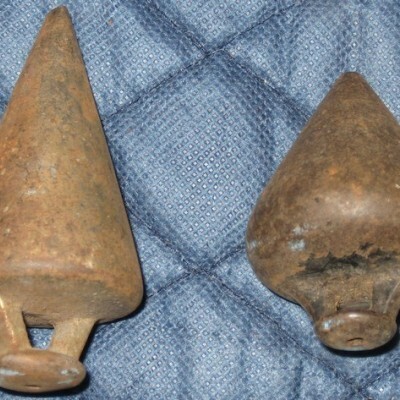 Two solid metal plumb bobs, used in carpentry on a plumb line. Both bobs are cone shaped with the hanger on the thick end. Plumb bob A is silver in color, but is fairly rusted. There is blue chalk residue on its sides as well. It is approx. 2" in diameter at its widest point and 3" in length. Its point has been chipped off. Plumb B is a darker metal, but is also fairly rusted. It appears to have had black paint on its surface at one point. It also has an approximate 2" diameter at its widest point, but is only 2.5" in length.